When we have weddings, must have items should be flowers, wedding rings or a 3 layer tall wedding cake. We might want to have a lot of modern pastries like rainbow cakes, macaroons or nicely decorated scones. However, its a different story for the Russians. 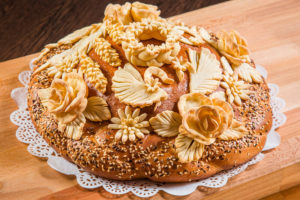 Traditional round loaf of bread known as Russian Karavai. A significant item at Russian wedding banquet. It traditional and authentic but it comes with great ritual doing during its preparation. Let’s check it out 4 interesting facts on Russian Karavai. For bakers and dessert lover, get your whisk ready, this will definitely interest you. 1. Loaf for Wedding or Funeral? Surprisingly, Russian Karavai is the main characters for both events. 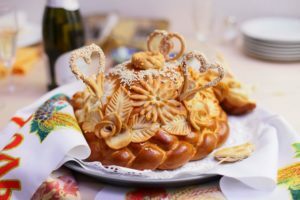 In one hand, Russian Karavai has a significant meaning of the symbol of love. This tradition is still carry on until the generation today. At the wedding, the newlyweds served Karavai as a token of appreciation for the gifts and well wishes dedicated to them. Only a happily married woman is the capable one of preparing it. It is to show her good wedding as an impartation to the newlyweds through the Karavai. As the woman knead the dough, she also had to read prayers asking for happiness and prosperity towards the bride and the groom. Another interesting fact would be the task of placing the Karavai during the wedding. Only a married man could this task. The Russians do hold a strong belief of experienced generation to be giving impartation to the younger ones. Karavais served after the church wedding ceremony. Another tradition also includes that only a child can cut the Karavais during the wedding. In a more ancient finding, bread symbolized as life. 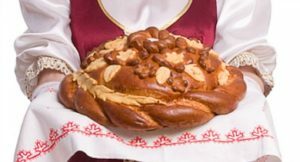 Russians treat bread as a gift from above or as breadwinner. Symbolizing life in rituals and traditions, that’s why Karavai played a big part in ritual marriage. Some believe that the puffier the Karavai is, the more blissful new family gets. Each piece of bread needs to be eaten, without leaving any leftovers behind to prevent loss of its power. Some also believe that it is forbidden to say anything bad about Karavai! Not only serve Karavai in special occasion, Russian Karavai is a good companion for housewarming parties. It a nice accompanying food to welcome guests to the house. Some host will prepare big Karavai just enough to share even with big family and friends. Some it is huge that the stove has to be built in custom so it is enough for sharing. Loaves of bread pictured as a symbol of peace and friendship between people. All age level love Karavai, from young kids to the older generation. It is a comfort and warm food for the Russians. 4. Bakers, Loaf It Your Way. Many versions and legend related to the skill of baking and serving Karavai. Art of baking homemade Karavai passed down from inheritance recipe from mother to daughter. Extreme attention to detail and neatness person required for baking Karavai. Bakers in out there interested in the arts of baking and decorate this piece of loaf. 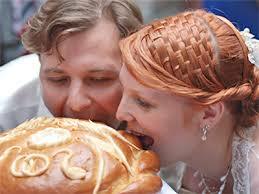 Some of the wedding loaves decorated with complicated weaving pasty. Some of the arrow-wood berries and branches crafted on top of the loaf required great skills and concentration. Decorations spread with egg yolk to result in beautiful golden color and shine crips.